There could be over $2 Billion in Christmas candy sales this year*. Christmas candy is more popular than ever. Just because it's popular, doesn't mean it's all good. In fact, some of it is downright foul. 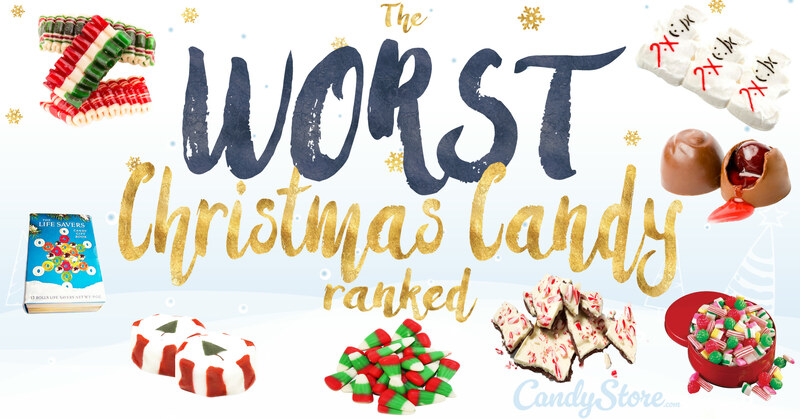 We surveyed over 13,000 customers who were all too happy to rank the worst Christmas candies ever. Their comments and rankings are below. Be careful when you ask someone what the worst Christmas candy is. Strong opinions flow easily. Asking people what their favorite [whatever] does not elicit nearly the amount of passion as asking someone what the worst is. True fact. When we asked our customers to give a couple optional words to explain their choice for the worst… Whoa, did the floodgates open. It’s like they have been waiting for an outlet for their bad candy juju to flow. Letting them get it out actually felt like a positive exercise (exorcise?). If you guys are reading this, I hope you felt a great weight lifted. And thank you for your replies. And that is how we came to rank the worst Christmas candy. While doing a larger survey, we tacked this on as a final – again, optional – question, hoping to get something out of it. Over 13,000 customers responded. There were a range of different candies mentioned. Since we had enough data, we narrowed it down into the top ten WORST Christmas candies. Disclaimer: The opinions expressed in this article are the author’s only and in no way reflect the opinions of CandyStore.com. Ok, we were all set to only do ten but this came in at number eleven. Given the extreme (cannot be overstated!) 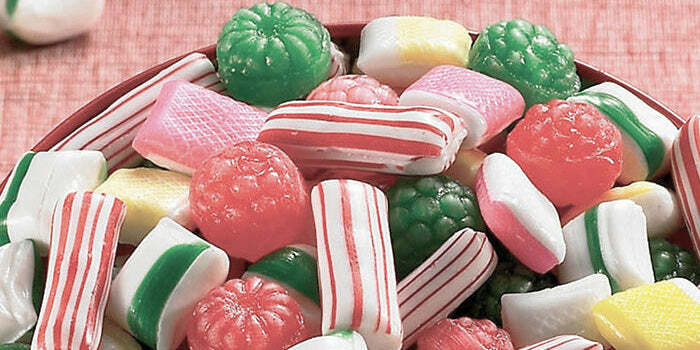 popularity of this candy during the holiday season, we though it merited a mention. Initial response from our team: WTH are you people thinking?! This is a huge seller and adorns a large number of peoples Christmas trees not to mention the general decor of pretty much everywhere in December. It’s objectively extremely popular. Why is it hated at all? I know everyone loves these, but it drives me crazy! They are hard to unwrap, become a slobbery mess and most of them end up in the trash half-eaten or untouched. Flavor = good. Inevitable sharpening into a dangerous stabbing weapon = bad. Hate. Hate. Hate. Why does everyone love these? Which global corporation pushed these into our idea of everyday Christmas? Canes are for old people. Hmm. Maybe it’s hard to verbalize an emotional reaction? But hey, logic need not apply when ranking candy. We are not here to judge, only to convey survey results, people. Ok, now the official top ten. I guess can see why they made the list, but they sort of don’t even exist in a world of food to me. It’s like a bowl of marbles that have been around since your grandmother’s parents played with them in the 1920s. They look like they used to be pretty, but are kind of faded and sad and nobody really regards them much anymore. It never really occurred to me to actually pick one up and try it. *Editor’s note: Many of these replies throughout the article are edited for language. Potty words are omitted or abbreviated for the children’s sake. People feel very strongly about this. I was forced to be polite and eat these when I was little. Death to the old-fashioned mixed candies. They’re not even sweet. Was sugar rare in the olden days? That old striped hard candy mix is like sucking on rocks. Whatever that ribbon stuff is, it ain’t candy. There should be a sign that says NOT FOOD. My sister loves the ribbon candy, but she never eats it. Because, duh it’s nasty and awkward. It should be a crime to call this stuff candy. The worst christmas non-candy candy. Yeah, so clearly no one enjoys the actual eating of these. In our era of capitalism, it of course make sense that anything popular will be replicated and iterated upon to infinity. The candy cane phenomenon is no exception. The results, however, are vile. The rainbow fruit candy canes could almost pass for simply bad. But even those saw a lot of mentions in people’s top 3 worst Christmas candies. Many people are probably not even aware of such franken-candy creations as gravy-flavored candy canes. That’s, gravy. Gravy. Run children! RUN! Those other candy cane flavors that are just weird. Don’t try so hard, candy canes. Why does anyone feel the need to F up candy canes? Rainbow candy canes are a disgusting trick to lure you in. It’s all those other candy canes, ya know? Not the red and white ones. Why they do that? Indeed. Why they DO that? Like many candies on this list, if you’ve never tried it you might think it could be good. It’s not. The minty flavor is just off, and its artificial sweetness and texture make me want to vomit. It’s like the Las Vegas architecture of Christmas Candy. Everything looks and sounds good and merry, but it is actually all made of the cheapest artificial material possible and completely falls apart under any serious evaluation of taste. And it make me feel like I need a shower. Super weird flavor. I just stick with the regular ones. Can’t go wrong. (Hard to argue with that! Original M&M’s are the best! 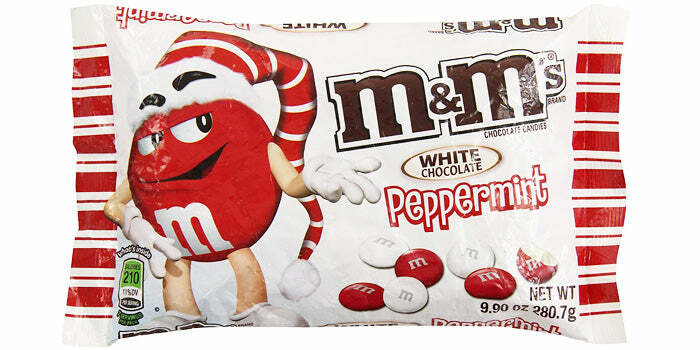 There are the mms that are like peppermint, or more like nastymint. Haha. These are the biggest joke. It’s not even that LifeSavers are all that bad. They’re fine. It’s the packaging here. And it is an egregious violation. eGREgious. Do not try package a bunch of lame Life Savers in a booklet Christmas story book and pass that off as something I wanna read / receive in a stocking / consume on the most specialist of special mornings of the year. As if the packaging of lifesavers wasn’t bad enough. Now they try this stuff. Please. Putting Santa on a box does not make LifeSavers festive. The LifeSavers storybook things I always threw in the trash. 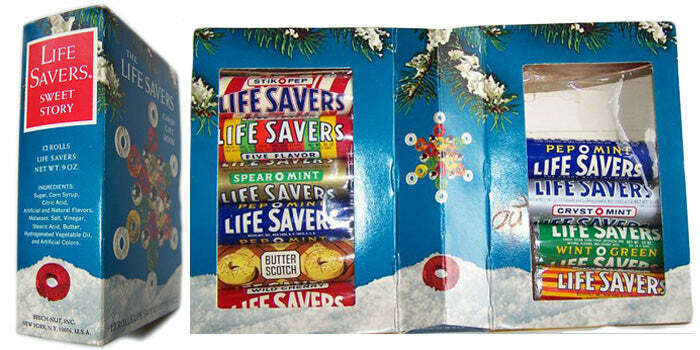 They’re not the worst candy per se, but the LifeSavers story book boxes were always such a disappointment. Sometimes a surprise in the middle is a good thing. This is not one of those times. Chocolate is good, yes. Cherries are good, of course. Why does this chocolate cherry cordial thing fail so miserably. As with many things in life, it’s all in the execution. And what in the name of all that is holy is that nasty watery sugar liquid seeping out from the inside. It’s just weird, and gooey in a way that totally creeps me out. In order to eat these without A) spilling nasty candy juice on yourself B) having to look at the inside of this vile creation and C) having anyone associate you with the nasty dripping chocolate thing you’re eating, you have to pop this whole thing in your mouth at once. Which I do not recommend. Those chocolates that are filled with liquid and a nasty cherry. Dude. Gross. Chocolate codial cherries. What is that like water inside. Ew. I like my cherries baked in a pie or on top of ice cream. 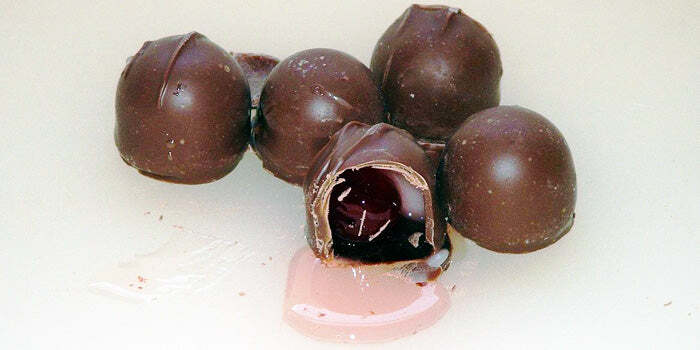 Those cherry inside a chocolate things. Wha-waht. This seem a little controversial. 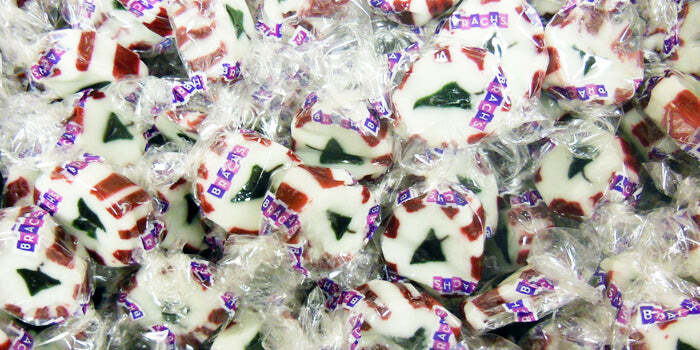 Peppermint bark was mentioned as one of the most popular candies in our recent state-by-state article. But it was also mentioned by a bunch of seriously passionate haters. I tend to agree. Also, the bark thing has been way overdone. Walk into Trader Joe’s and it’s everywhere. By the way, a Peppermint Bark smoothie is just a peppermint smoothie, ok. There’s no more bark if you puree it. The biggest thing for me is that it should be this crispy, sharp crunchy candy like the broken up pieces of toffee, but it’s typically not. It’s got no crunch, only a limp kind of give and then soft separation. No snap …unless it’s cold. Which is cheating and not really realistic for serving to other people. “Hey we got Peppermint Bark ya’ll! Dig in! …to my freezer.” Plus white chocolate is the runt of the chocolate family. Dark sits slightly above milk, and both are looking way down at white. We call peppermint bark Grinch vomit. Because it looks like Christmas vomit. I feel like Peppermint bark doesn’t live up to the pictures. It should be better. Candy cane bark. I can’t stand that stuff. 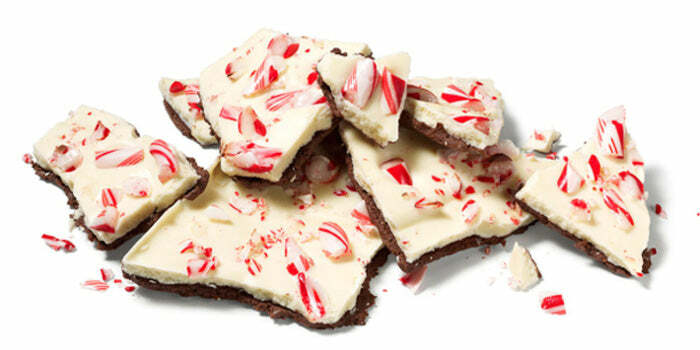 Peppermint bark because it melts in your hands in a gross way. As if we even need to address this one. Everyone knows Peeps = grody. The texture alone gives me the heeby geebies. Is anyone really under the delusion that these are actually marshmallows? It’s like swallowing rubbery styrofoam. Then there’s the fact that it’s basically just pure concentrated sugar with a coating of sugar on the outside. Look, we’re CandyStore.com and it’s still a bit much. Dial it down Peeps. Ya creepy little devil chicks. So obviously the Holiday Peeps are horrendous. The worst is the peppermint bark flavored one that is dipped in what is called chocolate but is more like brown candle wax. They’ve got a cinnamon roll flavored one now as well as a Sugar Cookie flavored one…what? If you’re thinking about giving them a try, I’d instead run the other direction as fast as you cant until you’re out of breath. Then keep running. Do Peeps count? They have Christmas ones now. If so they get all 3 of my top 3 votes. Peeps snowmen. Nice try Peeps, but it’s still a Peep. The Christmas Peeps gotta be up there. There’s a whole bunch of em now, all gross. Holy F___. Obvious. Peeps. Next Question. Ok, I’ve been pretty negative on most of these. I gotta say though, I disagree on this one. I like Reindeer Corn. Maybe it’s because I’m from Michigan. But there is substance here, people. It’s tasty sugary goodness. It feels like Americana, and if you cant get behind America on this one, I don’t know what to tell you. I do realize that the corn has many haters. Hate away, I love this stuff. Last year, my in-laws busted out Christmas candy corns. Do we have to do candy corn for every holiday now? The green and red candy corns. Who are they fooling? It’s the same nasty stuff. 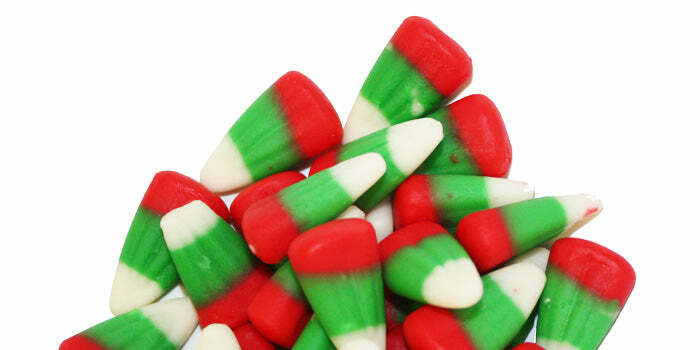 The filthy Christmas colored candy corns. Ick. The answer for worst candy is always candy corn. Seasons don’t matter. Everything about these is all wrong. First off, it looks like a poker chip that you can only cash in for sadness. The consistency at first is slightly resistant to the bite down and then accelerating into soft and gooey acceptance and then instant regret. The stick-to-your-teeth factor is suborbital. So you end up moving your jaws in as many different directions as they’ll go to try and unstick the damn thing. Then the flavor hits. Oh man. That false minty flavor that gives you a little twinge in your brain and makes you aware again that your gag reflex is still working. Wretched is a word that comes to mind. Seriously the WORST. 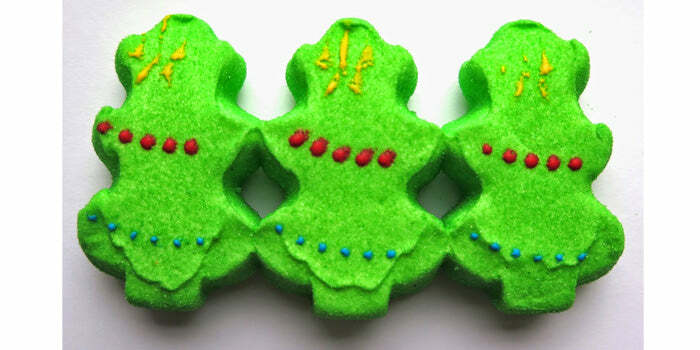 The Christmas tree nougat candies. My kid spits one out in my hand every year. The nougat with the tree on it. So so bad. The winner is Christmas nooget. Its always stale and so so gross. No one ever eats that stuff and I feel like the noogat gnomes come around and collect it to sell the next year. Hard and stale, and the flavor is unholy. * Last year, the National Confectioners Association forecasted $1.93 Billion. With the National Retail Federation predicting that 2018 Holiday spending will rise 4%, that would take 2018 candy sales above $2 Billion. I look forward to Christmas just so I can buy the Christmas Nougat Candy. In fact, I’m enjoying one now as I write this. Also enjoy a few other on the list, like the Lifesaver book and the Old=Fashioned Hard Candy. I used to have a cat who liked the fruity rainbow candy canes. She would break the plastic film on the top of the box to get at them. Old-fashioned hard candy mix – definitely agree. My grandmother, who’s been dead for decades, had a jar of this stuff that had to have dated back to the Hoover administration. The Lifesavers Christmas “books” – disagree. I didn’t realize these books were still being sold. 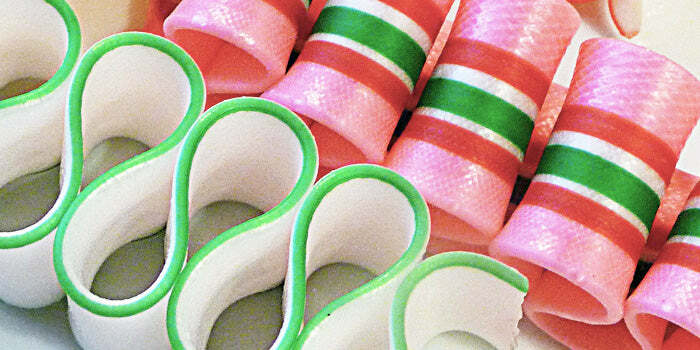 Ribbon candy – super nasty. At least three of those candies I really like and a part of the old fashion candy mix is great. I guess some people have odd ideas about what is bad! Non-peppermint candy canes can be very tasty, just don’t get weird about it. Your list is turned around. 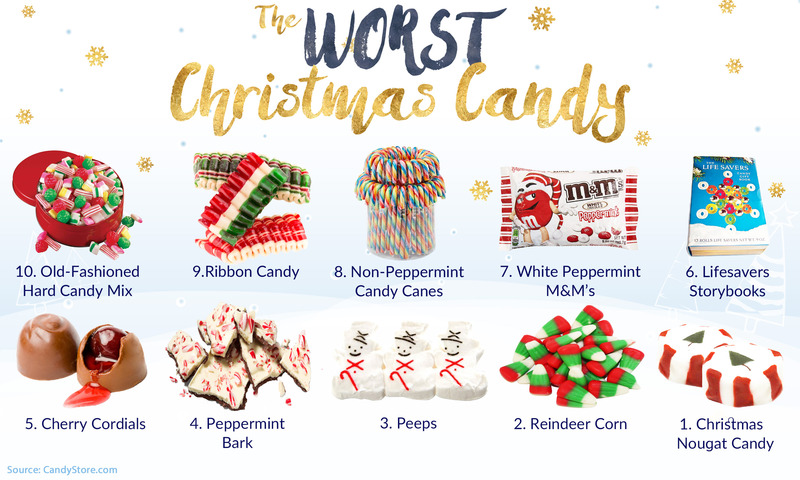 #1 worst, hard candies, followed by ribbon, and so on… I like the peppermint nougat, I received the Lifesaver storybooks every year in my stocking — but my kids detest them. Everything else is narsty! Christmas Nougats are my favorites too!!! What is wrong with people? And it is the only time of year that they come out! I only by the Brach’s kind because they are always fresh in my store! I have to wait 330 days to have them every year! !